In 1821, Mexico finally won its independence from Spain after a long war. It was a lot like the American Revolution against Britain; heroic generals led an army of poor, brave farmers against the Spanish army and by sheer guts wore the Spanish down. The constitution written in 1824 even called the new nation the United States of Mexico. It was larger than the United States, covering all of modern Mexico plus the western third of the modern United States. However, the new government had trouble getting its people to accept its constitution. 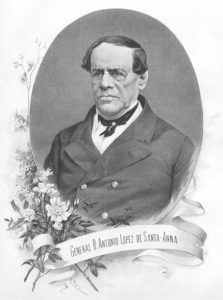 Several men claimed to have won elections for President, and eventually, a general named Antonio López de Santa Anna took over and named himself President. Some Mexican states did not think this was legal and refused to obey Santa Anna. Soon Santa Anna was leading his army back and forth across Mexico to put down the rebels. One of the Mexican states, Texas, had a lot of settlers from the United States living in it. They were Mexican citizens, but they refused to obey Santa Anna's government. They wanted the constitution of 1824 restored. In 1836, Texas declared independence from Mexico, waving a flag which looked a lot like Mexico's flag, but with the symbol "1824" in the middle. Texas thought the United States might come and help them get free from Santa Anna; after all, a lot of Texans were former Americans, who still spoke English and wanted to make Texas more like America. The United States didn't help, though. Texas raised an army, but it was a lot smaller and less well-armed than Santa Anna's. When Santa Anna came to Texas, he beat the Texas army at Goliad and the Alamo. He killed every soldier in the Alamo, but the Texans still didn't give up. Then Santa Anna chased the Texans deep into Texas, across the desert and the dry grasslands. The Texas army waited until Santa Anna's men were tired from the long chase, then attacked and defeated the Mexicans at the Battle of San Jacinto. Texas was now an independent country. They elected Sam Houston their first President and started writing laws while trying to keep Santa Anna from coming back. After ten years, Sam Houston convinced the United States to accept Texas as the 28th state. Now the United States came into Texas to protect its citizens. Mexico said the border between Mexico and Texas was on the Nueces River, but Texas said it was on the Rio Grande, a few miles south. Both countries thought they owned the land between the rivers. President James K. Polk of the U.S. sent soldiers between the rivers, and soon American and Mexican troops were shooting at each other. Polk got Congress to declare war on Mexico, although some Congressman, including elderly John Quincy Adams and young Abraham Lincoln, voted against going to war. A Mexican army was already attacking a fort which General Zachary Taylor (later president) had built between the rivers. Taylor sent more troops, but Mexican general Arista intercepted them, and several battles erupted. Taylor managed to capture Arista's artillery and the Mexicans retreated back into Mexico. Meanwhile, a few Americans living in California rebelled against Mexico and declared California an independent country. Soon American troops arrived and took over, with the Californians' approval. Mexicans were angry that their forces in Texas and California had lost their battles. Santa Anna came back from Cuba (where he had been living in exile) and took over Mexico again, naming himself President for the 11th time. He took personal command of the army, and just in time because Taylor was already trying to capture the important north Mexican city of Monterrey. Santa Anna arrived too late to save Monterrey but attacked with three times as many men as Taylor had. Two young officers, Braxton Bragg and Jefferson Davis, saved the U.S. line from collapse, and the Mexicans eventually retreated. Both sides had almost lost their whole army; neither army was able to attack the other until they got more men and supplies. Instead of sending Taylor more men, President Polk decided to go around Santa Anna. 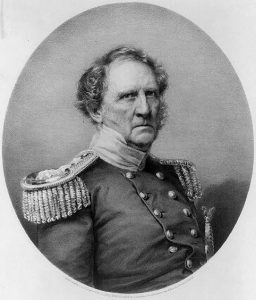 General Winfield Scott, with a second army, used American ships to land at Veracruz, a port on the Gulf of Mexico. Then he fought his way inland toward Mexico City, the capital of Mexico. Santa Anna met him halfway at the town of Cerro Gordo. The Americans set up their artillery and waited, and the Mexicans charged right into the guns. The Americans lost about 400 men, but Santa Anna lost over 4,000. Most of these weren't killed but taken prisoner by the Americans. Santa Anna fell back to the capital and the Americans followed. They attacked the Mexican military academy in Chapultepec Castle and captured it after a hard fight in which two of the heroes were the young Robert E. Lee and Ulysses S. Grant. Six of the students refused to leave their academy and fought to the death, becoming known as "Los Niños Héroes" in Mexican folklore. With the capture of Mexico City, the Mexicans could no longer control their territory and asked for peace. The Americans forced Mexico to give up the northern half of Mexico, which they made into the states of California, Arizona, New Mexico, Texas, Colorado, and Utah. Mexico and the United States have been at peace since 1848, but Mexicans still resent the taking of their northern lands by the Americans. Bragg, Lee, Grant, Davis and many other American soldiers of the Mexican War went on to command much bigger armies when Americans had their own Civil War in 1861-1865. Steve Johnson is a teacher at Saint Michael the Archangel High School in Fredericksburg, Virginia. These library books may be checked out by our customers. Click each title for availability and to place a reserve. An overview of the struggle between the Texan settlers and Mexico's General Santa Anna for control of Texas, with a detailed description of the 1836 siege of the Alamo. Includes biographical sketches and quotations of some of those involved. A biography of the president who led the country during the Mexican American War. Discusses the issues, including the concept of manifest destiny, that led to war between the United States and Mexico in 1846, the events of the war, and the impact of its outcome. Part of the Presidential Leaders series.